CARACAS, Venezuela — It's carnival season in Venezuela, though many citizens are not in a mood to party. Even the timing of the holiday is in dispute in a bitterly divided country buckling under shortages of food and medicine. The government of Nicolas Maduro declared that carnival festivities started on Thursday, several days early. But the opposition-controlled parliament asked legislative workers to stay on the job until the weekend, saying this is hardly a time for celebration. "Carnival without dreams," read a sign at a recent protest against Venezuela's dire economic situation. 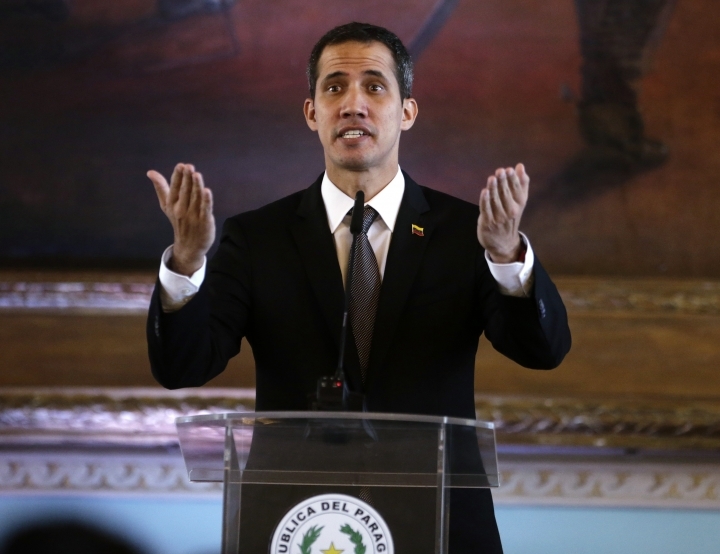 Venezuela is gripped by a political crisis that pits Maduro against Juan Guaido, an opposition leader who was in Paraguay on Friday as part of a campaign to build international pressure on his rival to quit. The United States has imposed oil sanctions on Venezuela in an attempt to push Maduro out of power, and on Friday slapped sanctions on six high-ranking Venezuelan security officials for obstructing the delivery of humanitarian aid into the country. Maduro had denounced the attempt to deliver aid across the border from Colombia last weekend as part of a scheme to overthrow him. Maduro's government said it is deploying thousands of officials to monitor roads and ensure the safety of those heading to the beach and elsewhere for vacation to celebrate carnival. Many Venezuelans, however, are struggling to get basic necessities and don't have the resources for leisure travel. Venezuelan television on Friday tried to drum up a festive mood with footage of people dancing and a screen caption saying music is a way to reduce stress and anxiety. Another caption described the carnival season as one of the most "entertaining and colorful" times of the year. The season, which runs through Tuesday, could be a significant moment in the Venezuelan crisis. Guaido has announced that he plans to return home in coming days to lead protests against Maduro despite what he calls threats against him. Maduro's government said the opposition leader had left Venezuela illegally, stirring speculation about whether it will attempt to arrest or block him from entering the country.